Collins Booksellers - A Taste of Love – The Memoirs of Bohemian Irish Food Writer Theodora FitzGibbon: Adventures in Food, Culture and Love by Theodora FitzGibbon, 9780717166848. Buy this book online. The Irish Times food writer Theodora FitzGibbon lived a life filled to the brim. Born in London in 1916, her appetite for love, pleasure, good food and adventure took her all over the globe until she died, in Dublin, in 1991. 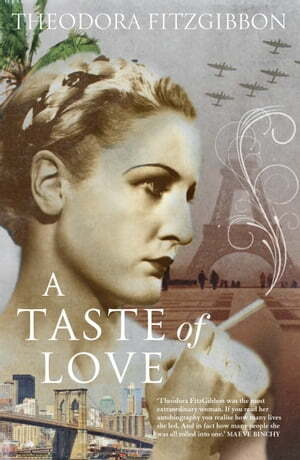 A Taste of Love, her two-volume autobiography, beginning on the eve of the Second World War and ending on the eve of the 1960s, reveals a life fully lived: the names she used before settling on ‘Theodora’; the cookery lessons given to her by the former Queen Natalie of Serbia; the 1920s childhood spent on food-chomping travels with her rakish father in Europe, the Middle East and India. As the century moved on, Theodora’s globetrotting adventures took her to Paris, where she struggled to maintain an independent life as a young actress, began an affair with photographer Peter Rose Pulham and kept company with Balthus, Cocteau, Dali and Picasso. During the Blitz, Theodora daringly escaped wartime Paris for bomb-ridden London, where she was friendly with Dylan and Caitlin Thomas, Augustus John, Francis Bacon, Shane Leslie and Soviet spy Donald Maclean, and adopted Gwladys the penguin and Mouche the poodle. As the war came to a close, she married Irish-American writer Constantine FitzGibbon, travelling with him to the US, and divorced him fifteen famously stormy years later. In 1960 she married George Morrison, the film maker and archivist, and they lived together in Dalkey in the house with the ‘sea at the bottom of the garden’.